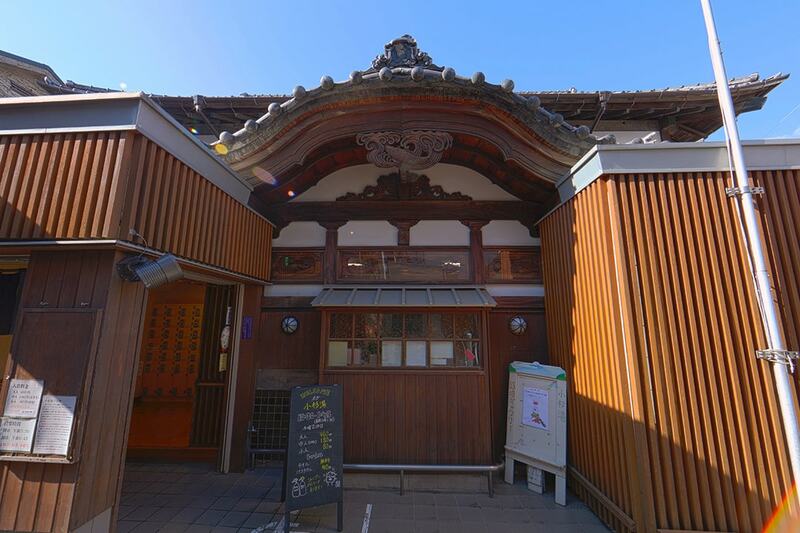 Sento is a public bathhouse established for bathing the locals in the days when having a private bath was not common. 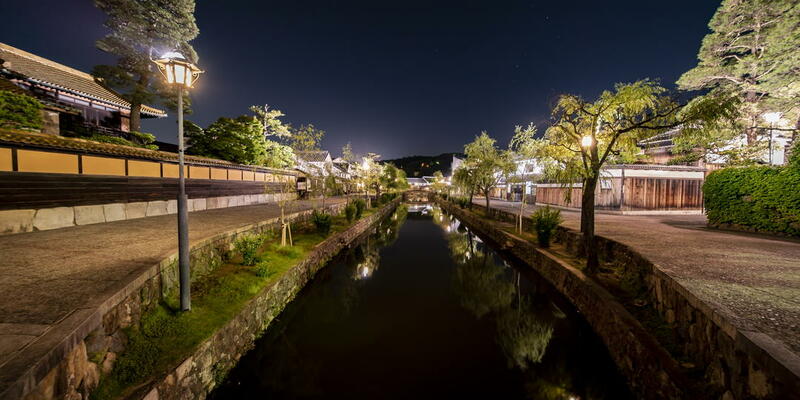 Although most houses in Japan today come with bath, there still are many public bathhouses that have been popular with the local people since olden days, that have become focal points of interaction beyond generations. A Sento is a wonderland where you can get a taste of daily life in Japan from decades ago, with the features like the huge bathtub, of course, in which you can stretch out your arms and legs as if being in a hot spring, and the building itself which is of classy wooden construction in many cases, the magnificent painting on the bathroom wall, bath water with various health benefits, the retro weight scale, the view from the quaint Engawa, the smiling bathhouse owner on the watch stand, and so on. Many of them use tap water for the bath water, but some of them use water from hot springs pumped up from underground. Here are some of the historic public bathhouses that have been popular with the local people for many years. 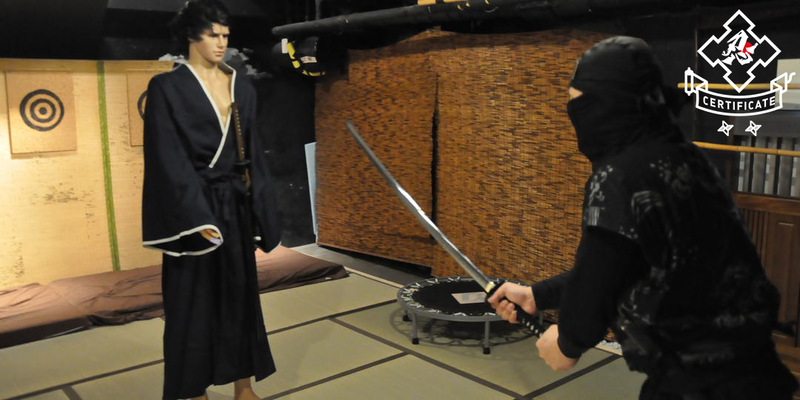 Why not lift the Noren curtain and experience a Japanese public bathhouse where young and old can relax their minds? 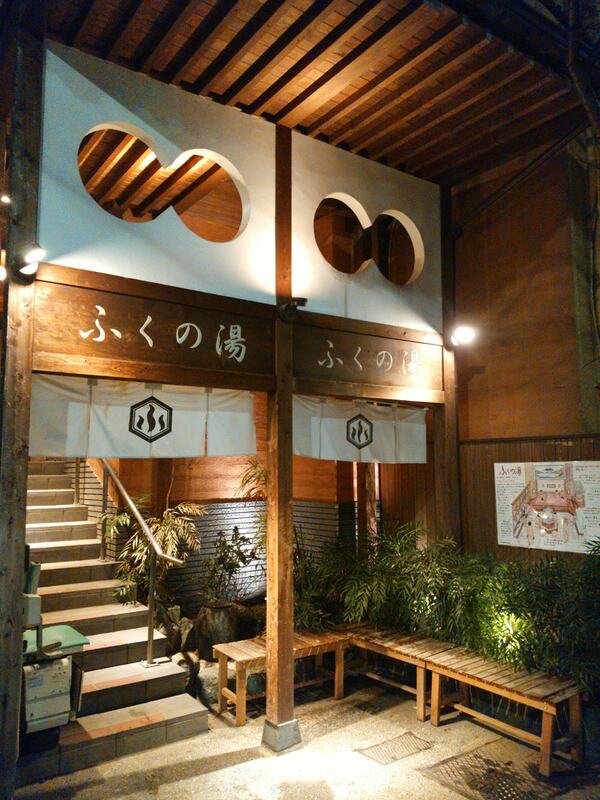 Eye-catching Miya-zukuri construction. Preserving the original features of the building constructed in1938, "Takara-yu" boasts a Japanese style garden which is acclaimed as the best bathhouse garden in the country. 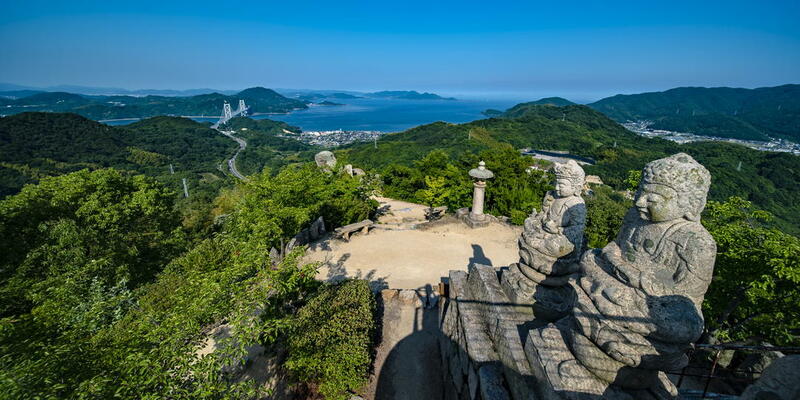 It is also called "King of Engawa", as you can enjoy watching the view of the garden with Nishikigoi carps and seasonal flowers, from the wooden deck called "Engawa" next to the bathroom. Another appealing feature is that you can enjoy many kinds of bath water, such as medicinal bath with crude drugs that relieves fatigue, and germanium hot spring which is good for beauty. 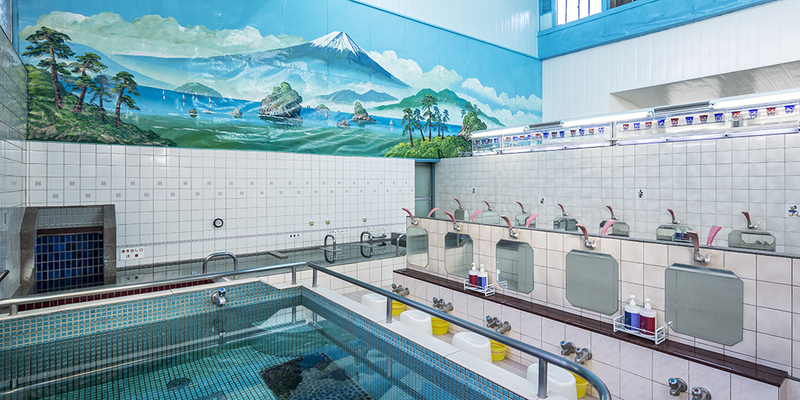 The specialty at “Kosugi-yu" is gentle-to-the-skin "Milk bath", using “return to nature water” which is well water pumped up from 90 meters underground and then purified which is believed to be good for skin, with an added additive-free milk component and natural oils. Amidst the sweet scent in the bathtub, you can enjoy a relaxed and luxurious time admiring the magnificent Mt. Fuji painted by Mr. Kiyoto Maruyama, a maestro in the world of Sento wall painting. The building gets lit up at night. 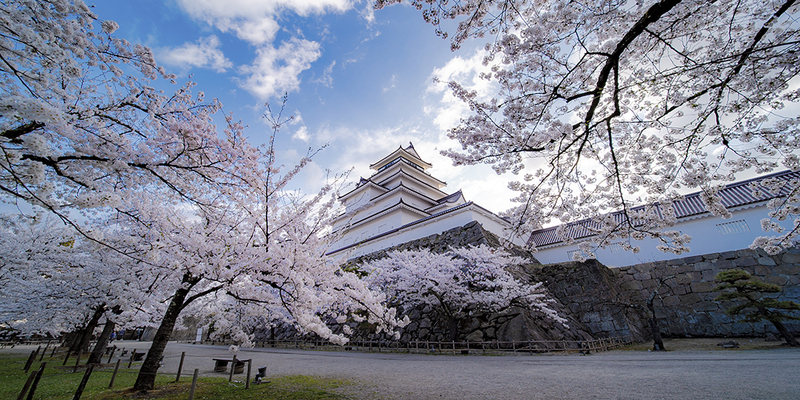 You can enjoy a fantastic atmosphere as the gently curving Karahafu-roof and the sculpted carps and Mt. Fuji emerge in the light as they are lit up. 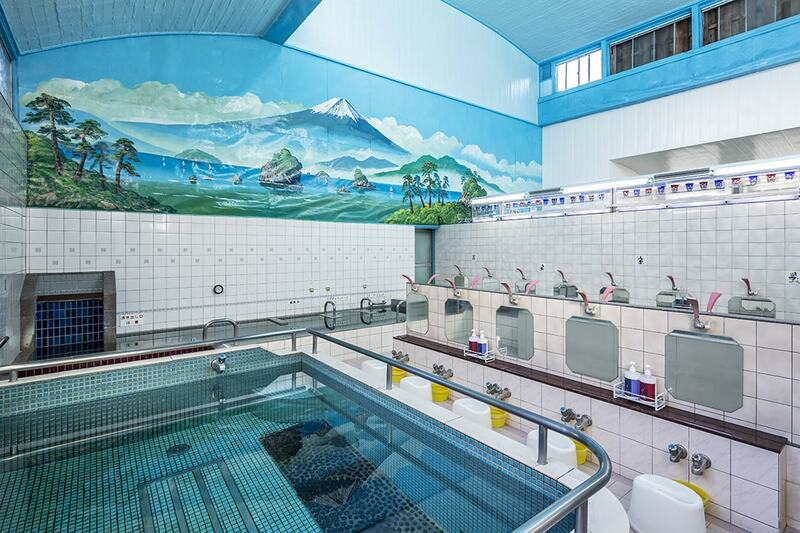 A public bathhouse in the hometown of Tokyo Sky Tree "Oshiage Onsen Natural Hot Spring Daikoku-yu". 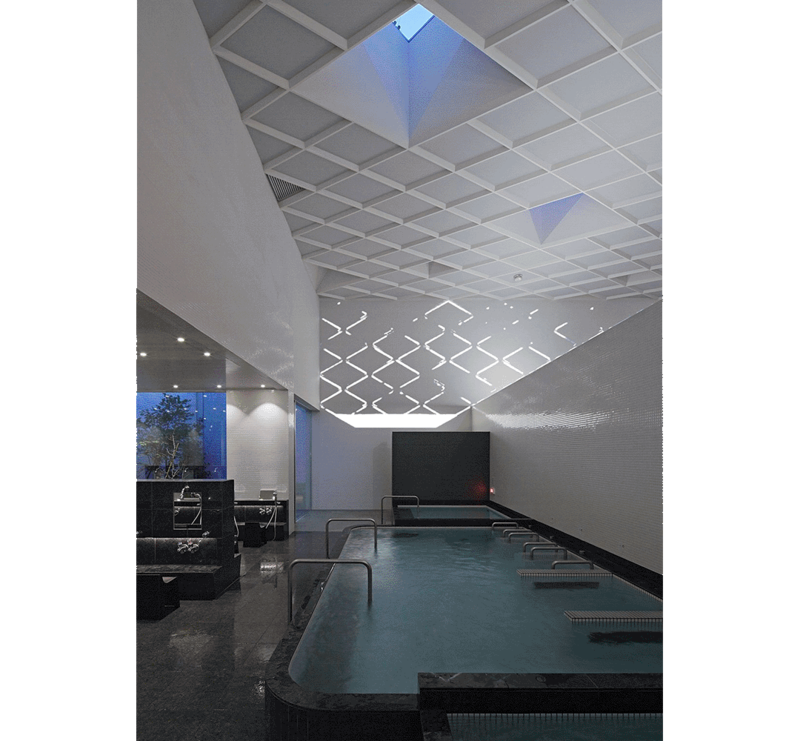 In the main bath, they use mildly alkalescent natural hot spring water from Meitai mineral spring, which has skin smoothing effect. Other baths you can enjoy a carbonated spring bath that promotes blood circulation and a medicinal bath. When you come out of the bath inside, you will also find a huge open-air bath. On the wooden deck on top of the stairs outside, you can enjoy the view of Tokyo Sky Tree paired with the chimney which has been kept ever since Daikoku-yu’s foundation in 1949. “Fuku no yu”, renovated in 2011 with a color scheme based on the Feng Shui theory, is a Sento which might bring you good luck. 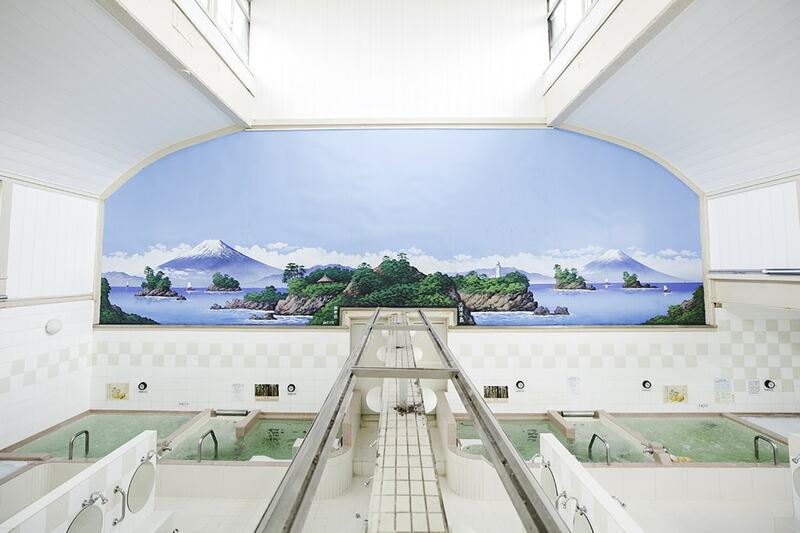 There are a medicinal bath and a radon hot spring bath which is believed to improve your immune system, with their users alternating weekly between male and female. They have a lot to offer here, such as the rare individual-sized bath “Tsubo-yu”, the hexagonally shaped washing space, the painting of Mt. Fuji, and the pine tree painted on the tiles. 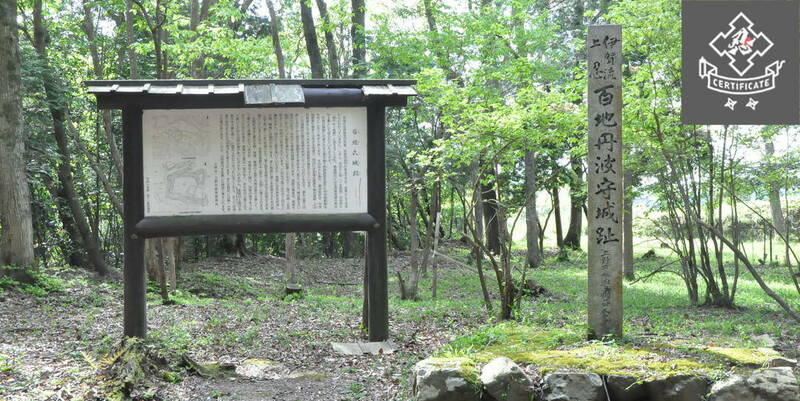 Why not take a walk and visit Sendagi, the town with a strong connection with famous literary giants? 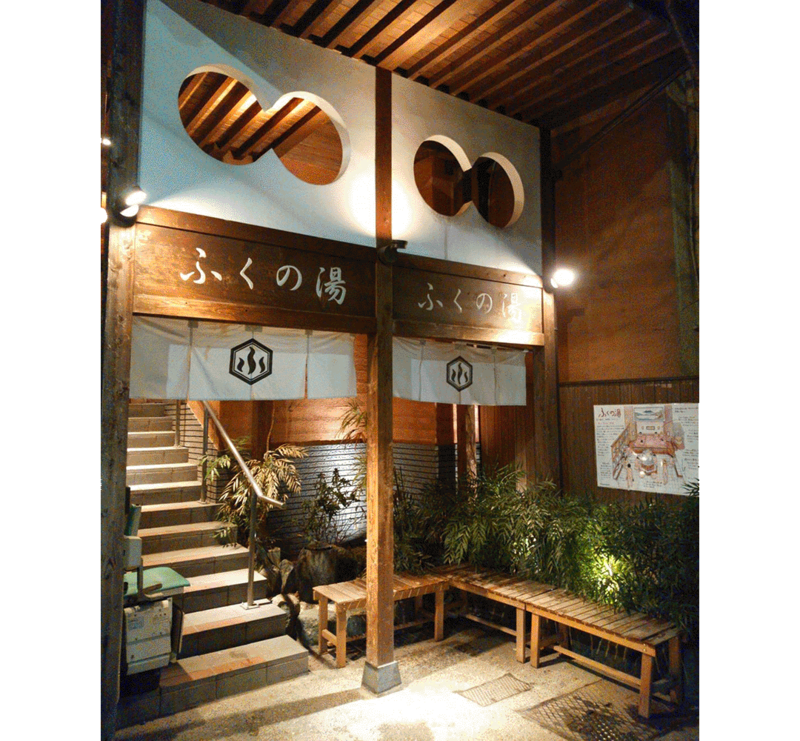 renovated in 2014 on the concept of “public bathhouse in a wild wood”, “Natural hot spring HIsamatsu-yu” is a modern and stylish Sento. 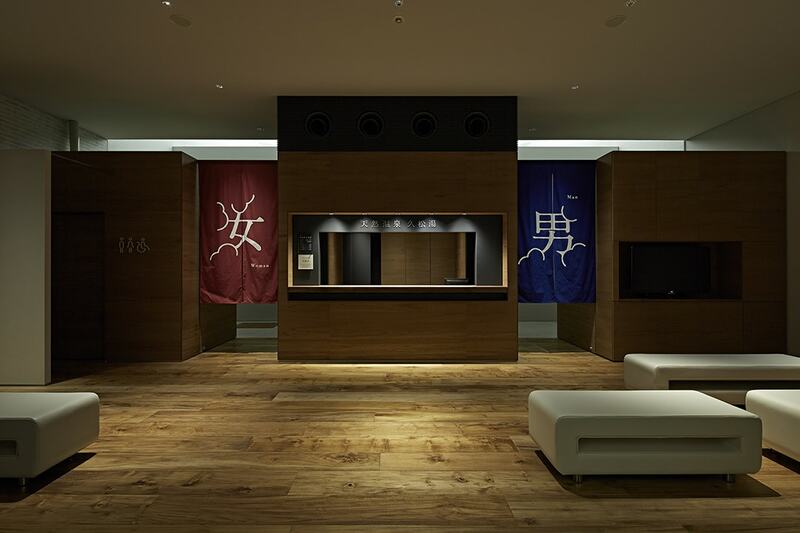 There are countless unique features at this Sento, such as the dressing rooms with a serene interior design using woody materials which are adjoined by the courtyard, a top light on the the bathroom ceiling through which you can look up at the sky, the open-air bath with natural hot spring water that soothes fatigue. After 19:00, dramatic projection mapping is shown on the wall of the dimly lit bathroom. You can spend a relaxing time soaking in a hot tub.